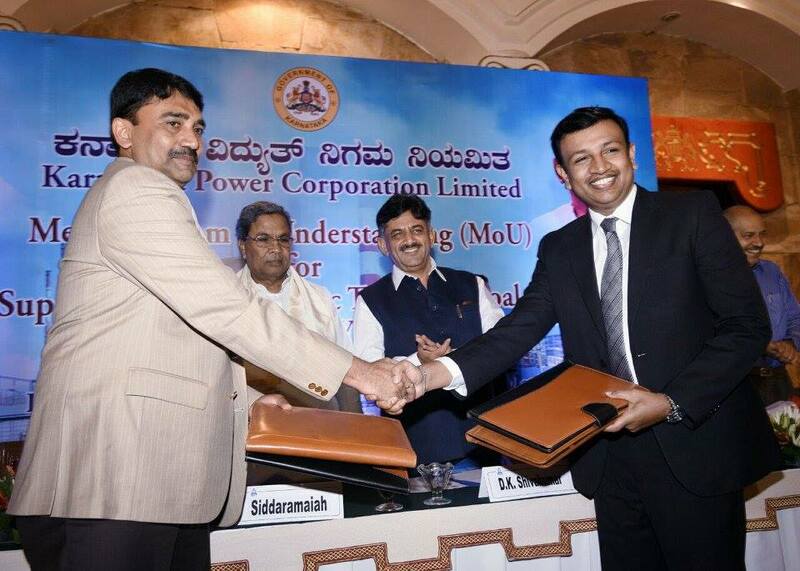 SCCL and Karnataka Power Corporation Ltd have entered into an agreement (MOU) for supply of 70 Lakh tonnes of coal to the newly constructed 3 units of Bellari Thermal Power Project and a new unit of Yerramarus Thermal Power Station, Raichur, in a meeting held at ITC Windsor hotel in Bengaluru at 8PM on 30th Jun 2016. Sri Siddaramaiah, Hon’ble Chief minister and Chairman of KPCL has attended the meeting as chief guest. Sri N.Sridhar, IAS, C&MD SCCL and Sri Kumar Nail, MD, Karnataka Power Corp Ltd have exchanged the agreement documents in the presence of Chief Minister Sri Siddaramaiah. This agreement comes into force immediately. SCCL has been supplying coal to Karnataka for about 27 years. Till last financial year the supplies were limited to around 6 MT only. After formation of separate Telangana State, SCCL geared up its production to 60 MT from 52.2 MT with a huge growth of 15 % and in 2015 -16 SCCL supplied 8.6 MT to Karnataka which is 33% higher than that of previous year. Keeping in view of the prompt and qualitative supplies of coal, KPCL came forward to have an agreement with SCCL for supply of 7 MT of coal for its newly constructed power projects. 4.0 MT to newly constructed Unit-1,Unit-2 and Unit-3 of Bellary Thermal Power Station, Kudithini, and 3.0 MT to Yerramarus Thermal Power Station, near Raichur. This is a win-win agreement between two organisations, where KPCL is going to get quality coal at cheaper rate (Rs 460 less price per every ton of coal) and SCCL gets a fixed revenue from a fixed customer. With this new agreement the total dispatches to Karnataka state would reach to 13 MT per year. On this occasion, Sri D K Shivakumar, Hon’ble Energy Minister Karnataka, said that this year KPCL could produce power uninterruptedly because of continuous supplies of coal from Singareni. He also mentioned that this year every power plant is supplied with ground stocks sufficient for20 to 25 days, against 3 to4 days stock in previous years. Sri N. Sridhar, C&MD said that SCCL is ready to supply coal to the coming up NTPC, KPCL Thermal plant and also ready to supply coal to all new cement, steel and other plants too if required . Other signatories present on the occasion were Sri Prasadarao, Addl Secretary, Ministry of Energy Karnataka, Sri N.Srinivas, Executive Director(CM).